America Under Siege: Insider Warns Of "Triggers For Islamic Uprising"
The new story from Scott Greer over at the Daily Caller reports the left has gone all-in on open borders after President Donald Trump's recently announced refugee ban here in America as all across the country, protests have erupted at airports with chaos ensuing. If one former Department of Homeland Security founding member is correct, what we're witnessing now in airports across the country may be only the tip of a very violent iceberg. And while the completely unaware protesters show disgust for Trump's recent executive order which falsely earned the title of a 'Muslim ban', the new story from Chris Menahan over at Information Liberation rips the hypocrites on the left and within the MSM into little bits and pieces. Proving to us that former president Barack Obama had previously BOMBED 5 out of the 7 countries listed on the Trump ban, why not a word then from the MSM or the rapidly disintegrating left? With Obama, John McCain, Lindsey Graham and the rest of the 'old guard' largely responsible for the absolute mess that Europe and the Middle East are in right now because of their endless corporate wars of aggression and their sponsoring of terrorists as Hawaii Democratic Congresswoman Tulsi Gabbard clearly pointed out in her 'STOP ARMING TERRORISTS' bill, why is the MSM blaming Trump for trying to clean up the mess that 'THEY' created? 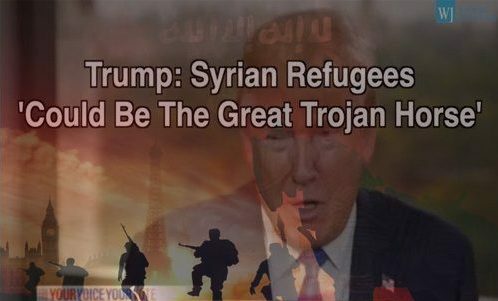 We take a look below at the warning given by former DHS insider Philip B. Haney that there are 3 triggers which we should be watching out for that could foreshadow a violent Islamic uprising in America, one of which they report Trump has already bumped into. We also take a look at the first video below called "America Under Siege: Civil War 2017" which takes a hard look at what could be a very real attempt by the left to overthrow America that we're just beginning to watch unfolding. While 700,000 protesters are converging on Washington D.C. for Inauguration Day—in addition to anti-Trump rallies planned in dozens of cities across the country—the political groups behind the protests remain shrouded in mystery. As Fox News Channel first reported, Civil War 2017 uncovers an extensive network of neo-Marxist operatives coordinating highly disruptive and potentially violent protests from coast to coast. In the 2nd video below from Infowars we hear from Congresswoman Gabbard in an excellent compilation that should be shown to everybody on the left now protesting in airports and across the country. Gabbard actually went to Syria and talked to the Syrian people and as we see in this video, she absolutely demolishes the MSM globalist narrative. 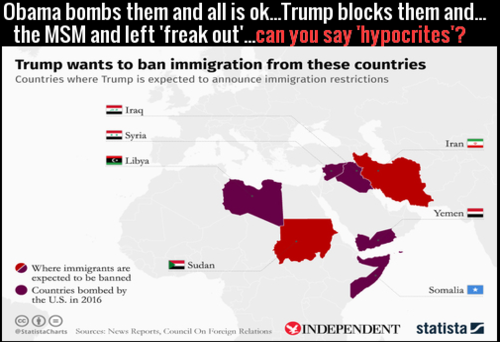 As Menahan reports in this story, out of the seven countries that were banned by President Trump last Friday, five were bombed by the Obama administration during his 8 years: Syria, Iraq, Yemen, Libya and Somalia. So Menahan asks, "Trump banning these people from America is bad, Obama bombing these people is good?" While the lying media is freaking out over President Trump's travel ban for seven Middle Eastern countries deemed security risks, they didn't give a damn about Obama bombing them. Though the media is currently in a tizzy because Trump's executive order held up around 300 people at airports, Obama's bombings were reported as completely reasonable to bring about peace. 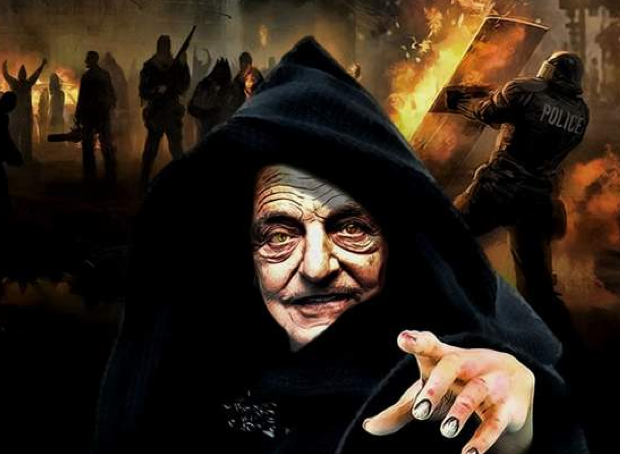 Where were the George Soros funded organizations protesting the "nearly 100 attacks" that have occurred since 2009 in Yemen "resulting in the deaths of hundreds of militants, but also many civilians?" Did Chuck Schumer shed a tear for the 62 Syrian troops killed and 100 more wounded that the Obama administration "accidentally bombed" in 2016? And while Trump will continue to be blamed by the left and the MSM, history will surely prove him correct as the European Union continues to crumble under the weight of the trojan horse invasion that George Soros has helped to unleash upon them. And while the totally clueless left will claim we should just allow a countless number of unvetted refugees to come into the US, they clearly know nothing about 'jihad' nor do they pay attention to what happens to the rights of minorities in country's that are majority Islam. If the religion of Islam is so great, why are millions of Muslims trying to get out of their countries? 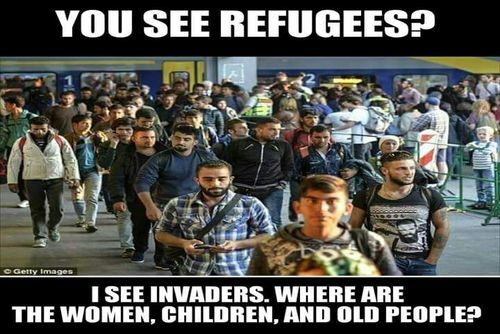 And with their being at least 50 majority Islamic countries in the world, why aren't those countries doing their part and taking in more refugees? As Breitbart reported back in 2015, five of the wealthiest Muslim countries have taken no Syrian refugees in at all, arguing that doing so would open them up to the risk of terrorism. Have you noticed? There has been more outrage from the left over Trump’s so-called Muslim ban, than over terror itself. More gnashing of gums and loud wailing, more placards decrying the plight of a few tourists and travellers, than over the bodies blown apart by Islamic extremists at Brussels airport in March last year. So much collective outrage, in fact, I wonder how on earth a ban imposed by 16 countries on Israeli citizens has remained in place for quite so long with such quiet acceptance. 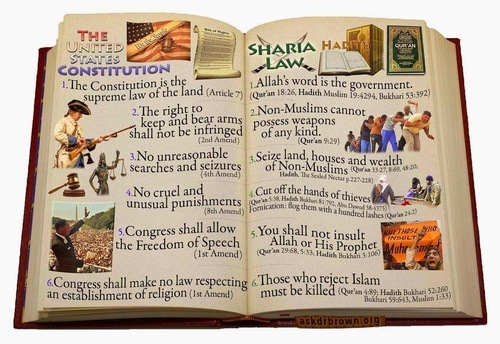 It's very clear to anyone paying attention that Islam DOES NOT go hand in hand with the US Constitution and freedom and if what we've really been watching over the last several years was a well-planned 'trojan horse invasion' of America and the West, President Trump is absolutely correct when he warns that there will be nothing nice about searching for terrorists. And a question that should go out to everybody now protesting against Trump's order, why should America continue to take in people from foreign nations who've vowed 'jihad' against us? And maybe an even better question would be, why does the left protest for the rights of those who don't want THEM to have any? Ask almost any gay or woman living in a majority Muslim nation about why they'd rather be in America than where they were living before. And just think, if during the past 8 years, the Obama administration had been tracking down terrorists who want to do Americans harm and destroy our way of life instead of focusing our multibillion dollar NSA snooping apparatus upon US patriots, Christians, 2nd Amendment supporters and other Conservatives , President Trump might not have to be going through the steps that he is taking that are absolutely necessary to 'weed out' the very bad dudes that have come here to the US only for jihad. Trump correctly states that those who will be loving towards the American people and our way of life are more than welcome here and its quite clear that he also knows much more about jihad and the Islamists overall goal to overthrow our Republic and impose sharia law upon us, stamping out all of our God-given rights that are merely protected by the US Constitution, than the snowflakes protesting in the streets and airports of America do. As we've long warned on ANP, law enforcement and national security experts across the country have warned of an 'ongoing trojan horse invasion' of America. If their warnings are indeed correct, the next several months and possibly years could be filled with the kind of 'not nice' Trump was warning of when it comes to hunting down terrorists, especially if the mosques they are attending aren't helping law enforcement out by providing names of those they suspect of being 'radicals'. The dangers that America still faces in the months and possibly years ahead are numerous and legitimate. As WND reports in their new story "3 Triggers For An Islamic Uprising Under Trump", the airport protests are likely just the start of planned chaos for the Muslim Brotherhood. And as Michael Snyder just reported over at the Economic Collapse Blog, recent events prove that the US is now sitting at the precipice of widespread civil unrest. Restricting Islamic immigration into the U.S.
Freedom to express yourself without violence in a country that has afforded everyone the Right to protest their message in a peaceful manner. The paid provocateurs are now facing criminal charges and righteously so! Yes...the shoe is on the other foot now and yes...if Hillary was in office, WE THE PEOPLE would have had to launch a dangerous revolution, (as specified in the 2nd amendment), but we succeeded without violence. The DIFFERENCE though is like night and day...because WE would have to act in-order to clean America of communism and government tyranny in every corner of America, including Washington D.C.
Now the FEDS can do it for us and we support Martial Law if used to keep intact the U.S. Constitution while cleaning-up America of gang infested thugs and other radical elements!! And while ANP would never 'beg on' martial law as its quite clear that once such law is declared, it immediately becomes a 'very slippery slope', if only martial law can bring about a return to law and order in such cities as Chicago, Baltimore and any other big or small city across America that breaks out into widespread chaos, we can almost guarantee that most of the people of those cities would be thankful to see order return to their streets in place of anarchy and chaos.